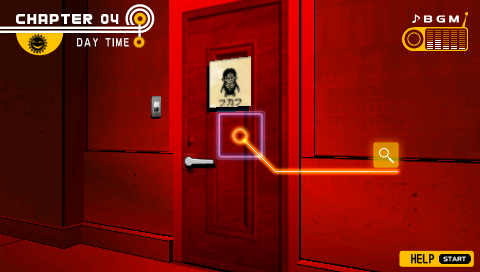 We're done with the right side of the room, so let's turn our attention to the left, starting with the door. 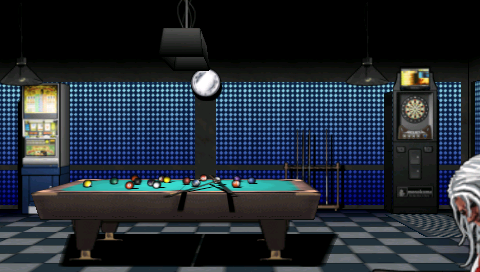 ...but that's because I broke it when I entered the room. 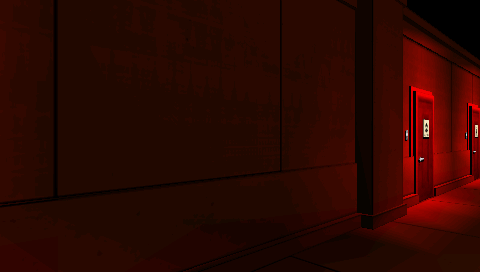 Other than that, I can't see any signs it has been mechanically messed with using a thread or something similar. 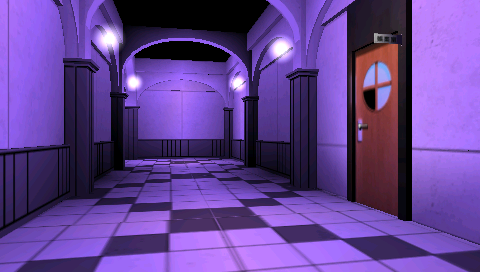 There isn't anything strange about the door itself. 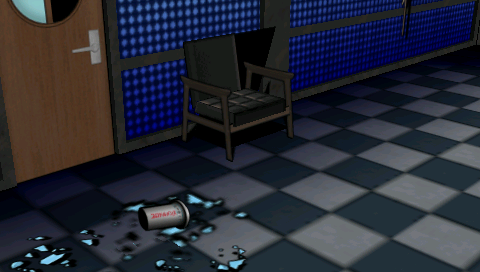 How about the chair that was blocking it? This chair was the reason the door wouldn't open before. The reason we couldn't open the door was because someone wedged this chair under the handle. That prevented the handle from being turned around, and so the door wouldn't open. The culprit couldn't have shut the room down from the outside. They must have done it from inside the room. 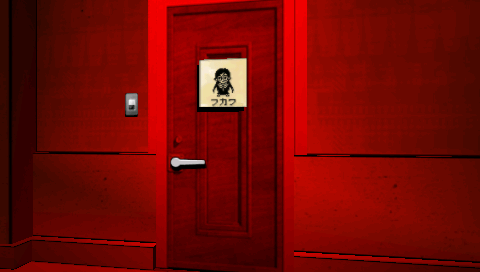 Recreation room's door was added to your notes. 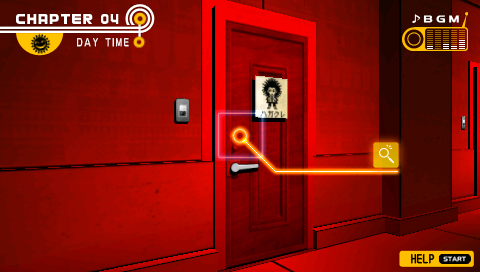 Observant readers probably noticed something else suspicious near the door. 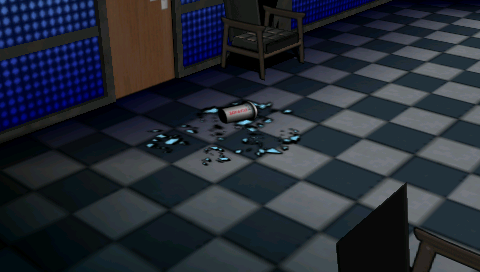 There's a plastic container on the floor next to the door. This is a can of protein. But there's nothing inside. She even treated it as the ultimate medicine. You shouldn't buy into that. It isn't actually medicine. 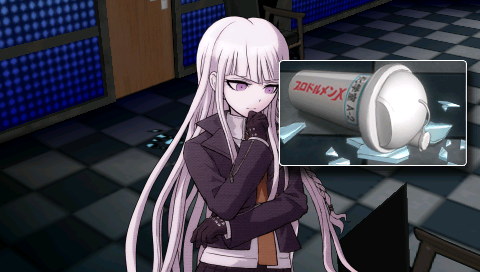 Now that I think about it, Oogami-san did say she found some kind of premium protein in the fourth floor chemistry lab. 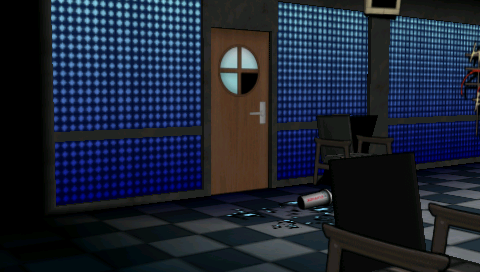 ...She probably brought a can down from the lab over to this room. There's glass scattered around the protein can. Light-blue shards of glass... They're from the window I broke. 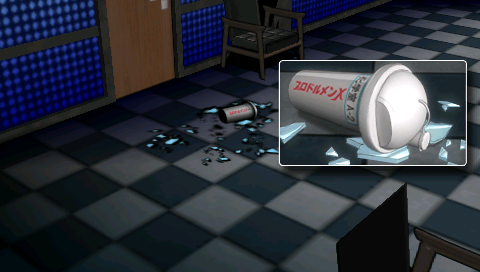 Those shards aren't just around the can, there are also a few under it. 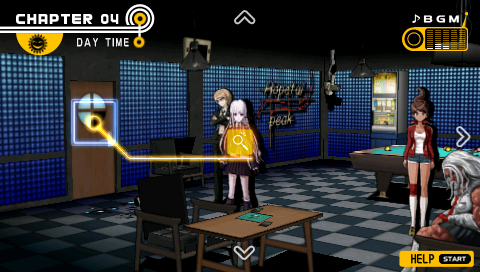 ...Is something wrong with that? I can't say anything concrete yet, but it's something to keep in mind. At the very least... it may become an important clue. 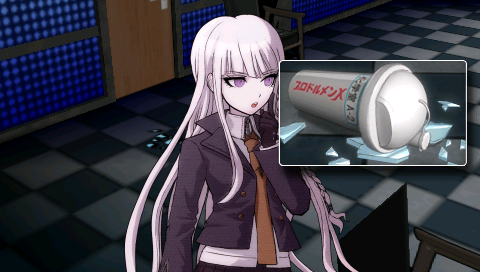 An important clue... What does she mean? 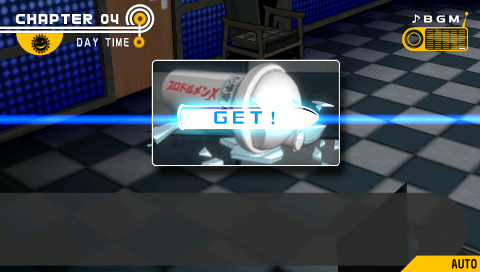 Empty protein can was added to your notes. 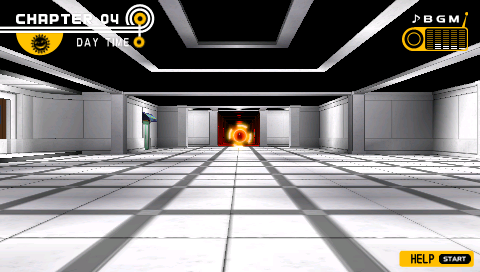 Time to turn our attention to the others in this room. 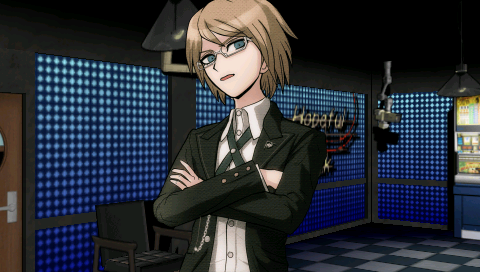 Maybe Togami has something to share? ...What is it? Don't get in my way. Go somewhere else. He looked at me in contempt. I decided to walk away before he gives me a soul crushing speech. I guess not. 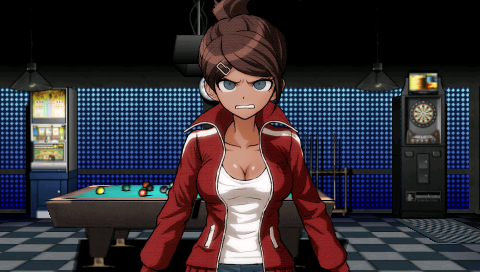 Asahina will probably treat us better. 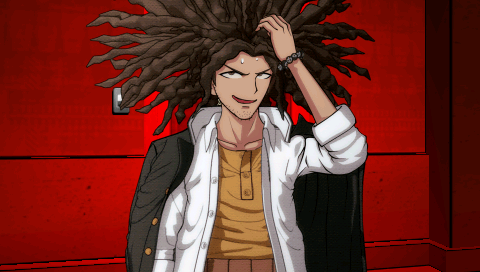 It's either Togami, Fukawa or Hagakure! In that case... I'll tell you something else. Sakura-chan called those three out. 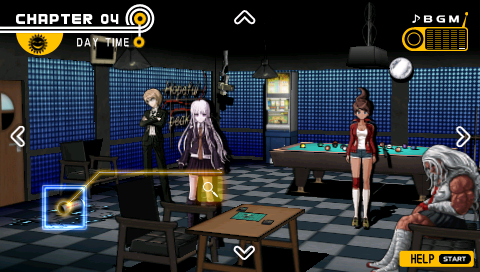 She invited them to this very recreation room. Do you remember this morning, when me and Sakura-chan left the infirmary together? But she told me about it when I met her later. The notes asked them to "Come to the recreation room before noon". "Before noon"... That's close to the time of death...! I'm not lying. I heard it from Sakura-chan herself. I could tell her it's not her fault... but it would be useless. 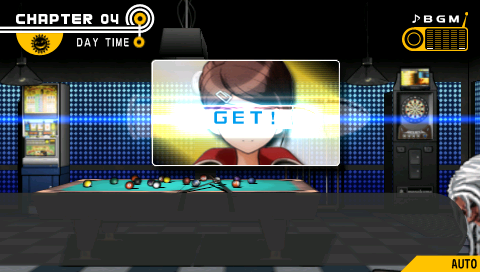 Asahina's testimony was added to your notes. I should probably confirm that with the people involved directly. One of them is right here. ...What is it? Don't get in my way. 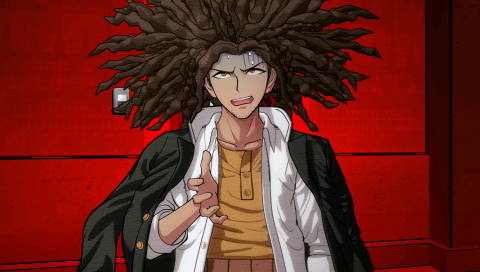 Is it true that Oogami-san invited you to the recreation room? It's true there was such a note stuck in my room's door. But who'd be stupid enough to accept that kind of an invitation? That monster probably just wanted to kill me. Of course I didn't. I threw the note away. 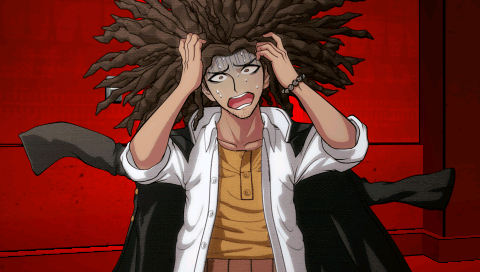 I didn't see Oogami even once today. 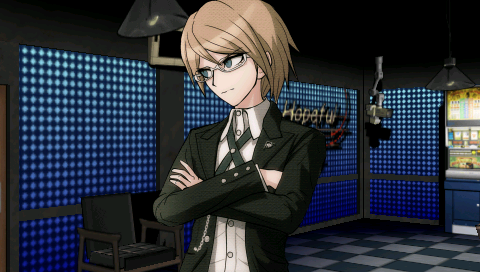 Togami-kun says he didn't accept the invitation... I wonder if he's telling the truth...? But... as long as I don't have any evidence against it, I should probably believe him. If you have nothing more to say, go away. 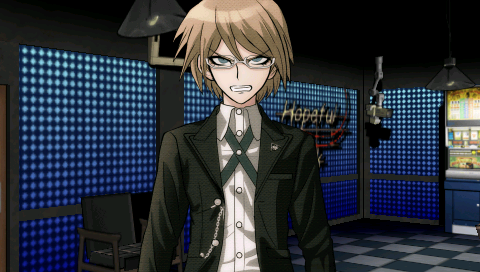 Togami's testimony was added to your notes. 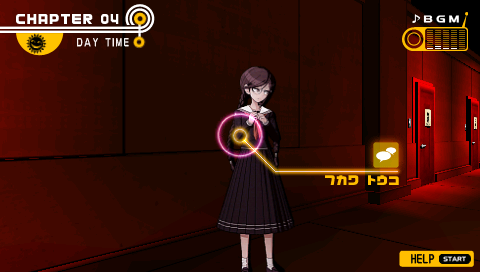 ...How are you doing, Naegi-kun? Are you done looking around this room? ...In that case, you should go get some more information. I am guarding the crime scene, so I can't leave this room. Therefore, I decided to make you investigate for me. Shouldn't she at least ask me first...? But... there's no doubt we need to question the people involved. 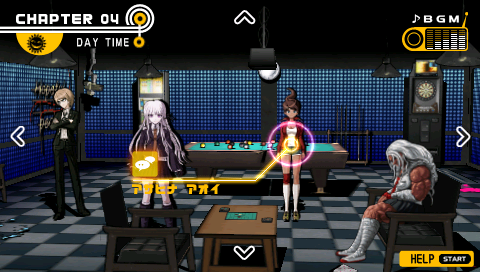 The two remaining people Oogami-san invited to the recreation room... I should go hear what they have to say. Those two must have gone back to the dormitory. 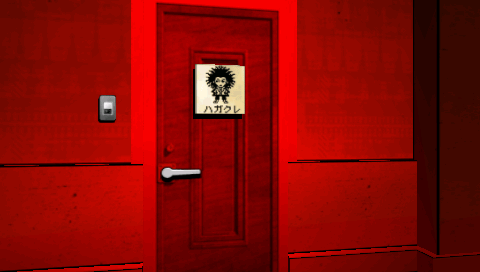 We'll start with Fukawa, just because her door is closer. What...? What do you want...? 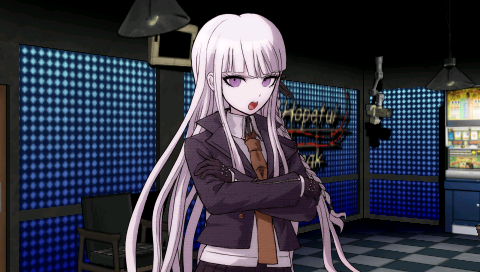 You've... reverted back to Fukawa-san, didn't you. 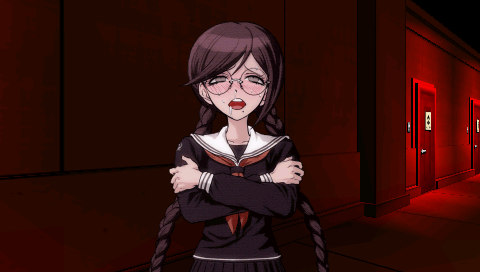 You're no longer Genocider. ...Um, I have something to talk to you about. Is now a good time? 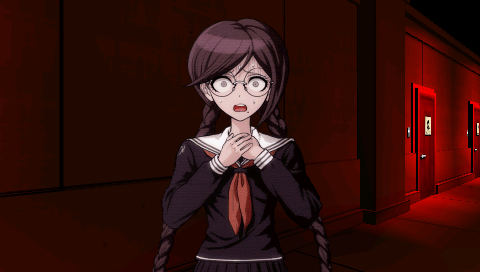 Fukawa-san made a crude disapproving noise but came out into the corridor. Isn't it you who keep talking about such things, Fukawa-san? A...are you trying to be smart with me? Someone in your lowly position? 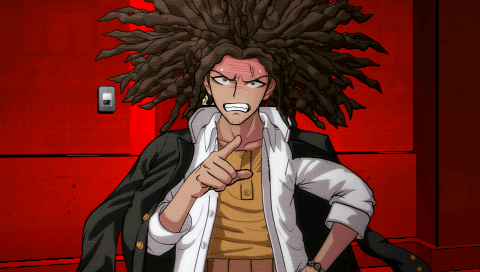 Y...you can't...! 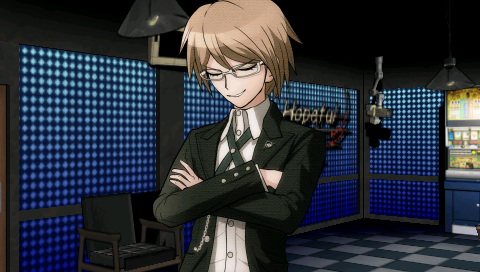 The only man allowed to be smart with me is Byakuya-sama...! I...I'm not sure how to respond to that. I...I know nothing... I don't know anything...! 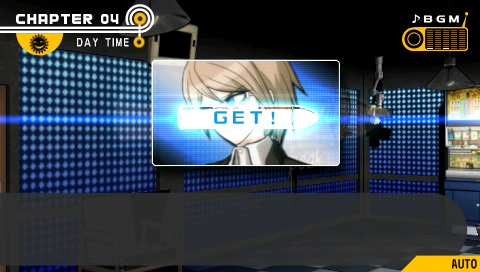 ...Togami-kun already confirmed he was invited. Eh...? 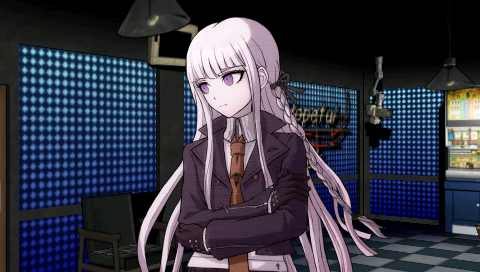 She also invited Byakuya-sama...? T...that was a clear giveaway that I was invited as well, wasn't it...! 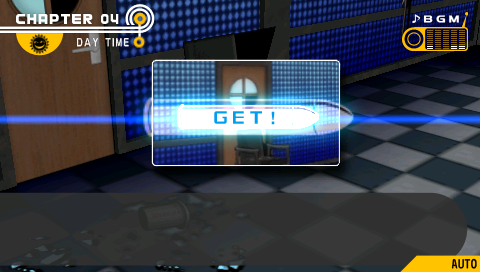 S...sure. So, do you have anything to say...? B...but... I never went... I was too scared to go...! 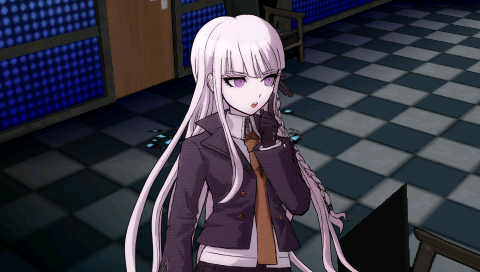 ...Is she telling the truth? As long as I don't have evidence against it,I should probably believe her. 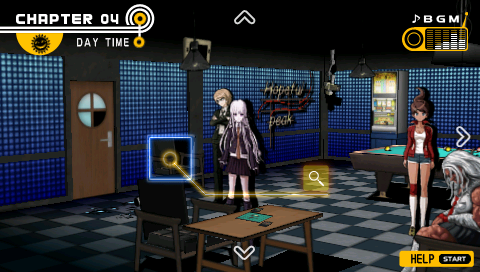 Fukawa-san hurried back into her room. 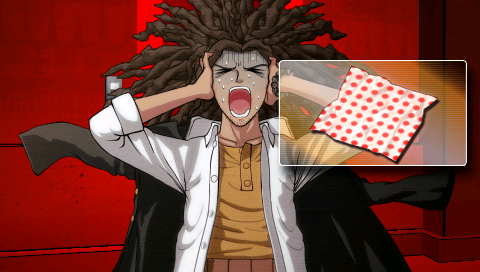 Fukawa's testimony was added to your notes. 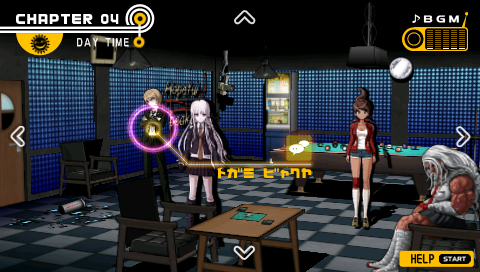 Naegi-chi... What's up? Do you need something from me...? H...h...how come you know that!? 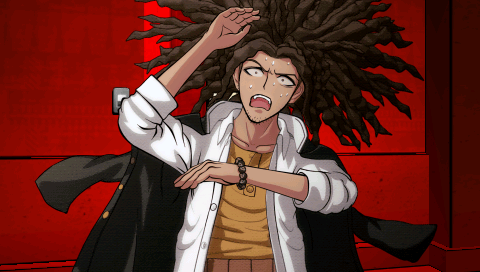 Ah...! Did you read my mind? 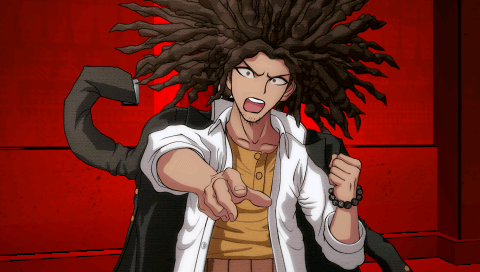 Did a strange power awaken inside you?! But, I wasn't the only one who was invited, 'right?! I heard it from the Ogre herself! 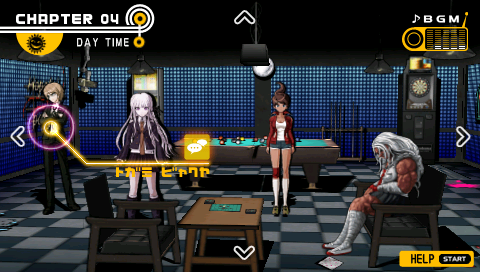 She also invited Fukawa-chi and Togami-chi! Eh? 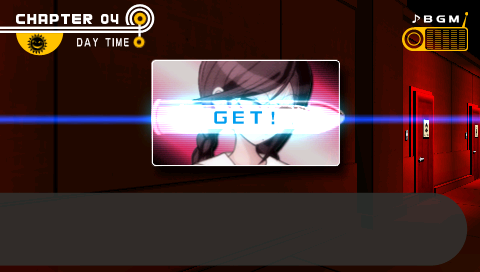 You heard it directly from her? When did you talk to her? It was when she came to invite me!! Didn't she just leave a note...? She came by to deliver it by hand!! That's when she told me! He's being... way too suspicious. So, did you go to meet her? I...I didn't go! Why would I?! 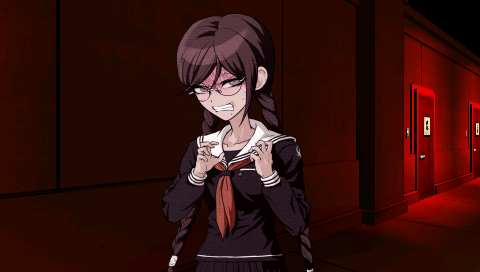 The last time I met the Ogre was when we took Asahina-chi to the infirmary! I've never even seen her after that!! 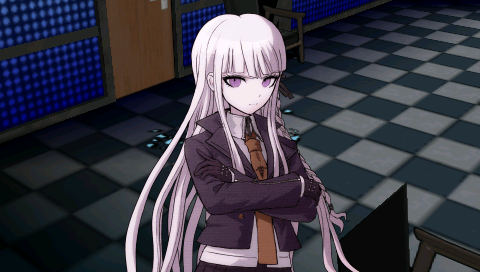 By the way... can I see the note she gave you? Sorry! I don't have it!! 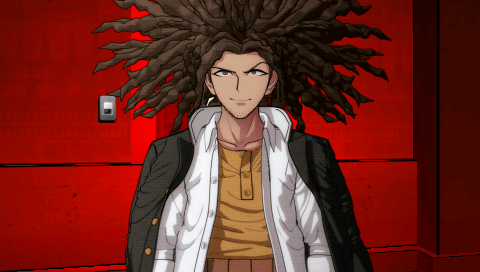 Flashing a stiff smile, Hagakure-kun took his hand out of his pocket. Then, suddenly, something came falling down in front of my feet. ...and stuffed it back into his pocket. 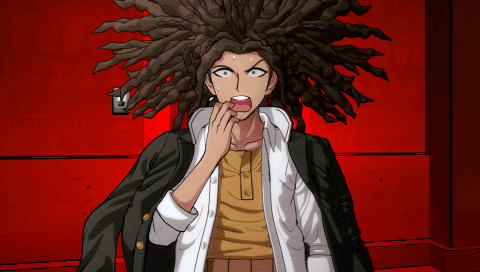 Hagakure-kun ended the conversation without waiting for a reply, and escaped back into his room. It wasn't garbage at all, was it. 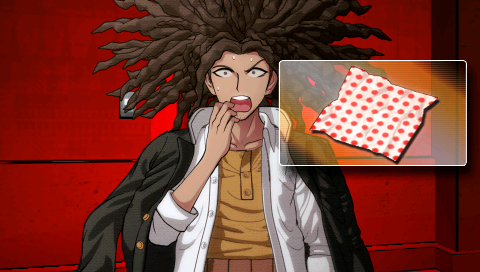 Garbage in Hagakure's pocket was added to your notes. 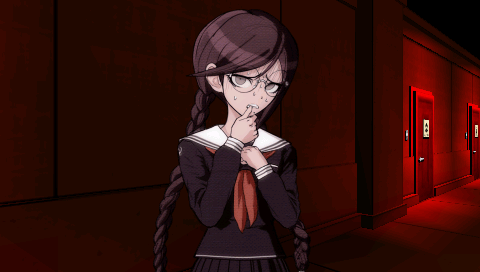 Um... What should I do now that I heard from Fukawa-san and Hagakure-kun...? It most likely came from the chemistry lab.